Hi folks, Doc here. The set featured in this pictorial is another one of the high points of the Classic Period of Gilbert Erector. 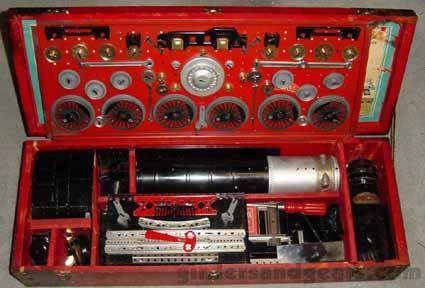 The set features the most specialized model ever developed for an Erector set of any period, the Hudson and Tender. This time, for a change, the particular set shown below is not my own. Rather, it belongs to a friend of mine, Bruce Hansen, who was good enough to share some photos with us. So, without further ado, here's Bruce to tell you about it. 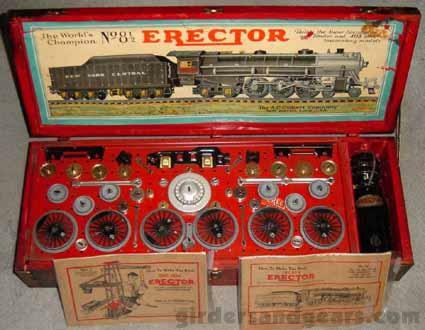 "Without a doubt, the most spectacular Gilbert Erector set model was the Hudson Locomotive and Tender. The model was introduced in 1931 and was available through 1937. 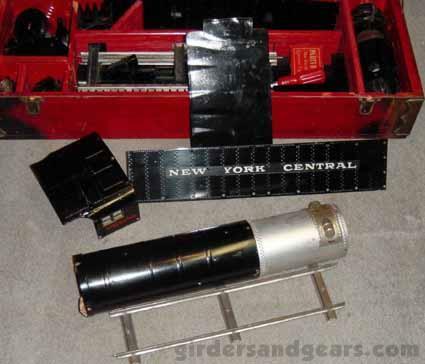 When the "Hudson" arrived on the scene in 1931, it was available in 4 sets (#8, #8½, #10 and #A). It was also available from the factory as an assembled model. Here are a few pictures of my 1932 #8½ set. The biggest difference between the 1931 and 1932 versions are a change in motors (P58 in 1931, P56G in 1932). The #8½ Hudson built all the models up through the #7 set. There wasn't enough room in the box to include the White Truck parts from the #7½ set. Many parts were displayed on a top tray with many more stored below. The Hudson model is a static display model and was not intended to run on a track. A motor can be installed "under the hood" to run the wheels and valves. There are over 70 unique parts involved to make up the locomotive and tender.